Step up the challenge and enjoy the energetic pace of the Experienced Course. 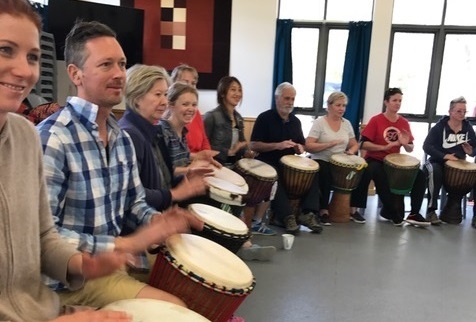 Experienced teacher, Kate Gascoyne, will develop your musicianship and playing technique while introducing you to the accompaniments, breaks and solo phrases of more complex traditional West African rhythms. Bring your own djembe or hire a djembe (for an additional $30) to be brought to each class for you. It is recommended that you own your own djembe so that you can practice in-between classes. Accredited by the ACT Teacher Quality Institute (for up to 12 hours of accredited Professional Learning). Please note future courses may display as 'Sold Out' as vacancies are not identified until closer to the course start date (after current students have had the opportunity to re-enrol). If this is the case, please join the waiting list to be notified when vacancies arise.